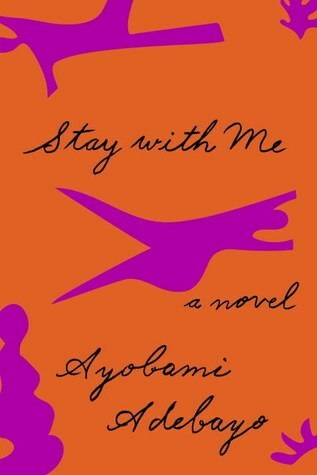 Summary (Provided by Goodreads): Yejide and Akin have been married since they met and fell in love at university. Though many expected Akin to take several wives, he and Yejide have always agreed: polygamy is not for them. But four years into their marriage--after consulting fertility doctors and healers, trying strange teas and unlikely cures--Yejide is still not pregnant. She assumes she still has time--until her family arrives on her doorstep with a young woman they introduce as Akin's second wife. Furious, shocked, and livid with jealousy, Yejide knows the only way to save her marriage is to get pregnant, which, finally, she does, but at a cost far greater than she could have dared to imagine. An electrifying novel of enormous emotional power, Stay With Measks how much we can sacrifice for the sake of family. This book was my pick and I found it last year. In fact, I found it right before my last book club choice and almost switched to this one. Yejide and Akin have been married for 4 years. They have been trying to have a baby, but she has not been getting pregnant. Then one day, Akin’s family shows up at his door with a second wife. This story follows Yejide and Akin through the ups and downs of their marriage as well as the ups and downs of the Nigerian culture and life. I picked this book for a few reasons. The first was that the drama of a married couple being given a second wife to have a child just sounded too good to pass up. The second reason was that I had never read a book written by a Nigerian author, with Nigerian characters, that takes place in Nigeria. It was a bit outside my comfort zone, but the storyline itself was enough within my comfort zone that I thought it would be a good choice. I think the best way to describe this book is exactly as I stated above. Outside my comfort zone. A lot of the cultural aspects made it difficult to connect with the characters, which I didn’t expect. I enjoyed reading about how they handled situations, but some of it was so foreign to me. In the end, I don’t think I ended up liking any of the characters and that was hard. The book is told in 4 parts. It starts in 2008 with Yejide on her way to Akin’s father’s funeral. It then jumps back to the 1980s where a second wife is being presented to Yejide. From that point on, the parts of their marriage and relationship are filled in. At the beginning of each new part, it starts off in 2008 and then flashes back to the 1980s. Most of the book, at least at the beginning, is told from Yejide’s perspective with a few chapters here and there from Akin’s. I don’t want to say much because a lot of this story relies on the slow reveal of information. There were a lot of pieces that I didn’t expect that definitely made the story what it was. I had a bit of a love/hate relationship with this format. I liked that pieces of information were revealed over time and not all at once, but there were parts where I was definitely confused and felt like I should know what was going on but didn’t because that piece had not been revealed yet. Overall, I’m glad that I read it and I did enjoy it. It was definitely a different experience. I don’t know if I would read it again, and I don’t think it would be a book that immediately comes to mind for a recommendation. But, if someone specifically asked me about it I would recommend it for sure. It seemed like we were all pretty much on the same page with this one. We all expected this book to be completely different than it ended up being. It took a lot of turns that were unexpected and because of those, we were all a bit unsure how we felt about it. There were a few of us who liked it more than others, but none of us were in love with it. I was also glad to see that I was not the only one who found these characters so unlikeable. The difference in culture and the seeming insanity of the events led to a good discussion. It was interesting to see that this book wasn’t as polarizing as I thought it would be. I thought that there were going to be members that came in saying “this was the worst book I have ever read” but they didn’t! There was some discussion about it being a little hard to get through at times, but we’ve definitely had books that people have liked less. I’m glad I picked this as a book club read, because it was fun to discuss it after reading.